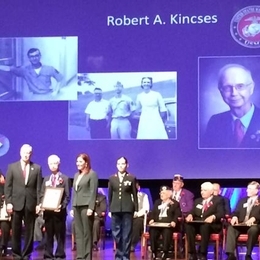 Sinclair alum and active volunteer Robert "Bob" A. Kincses was inducted into the Ohio Veteran's Hall of Fame at a ceremony in Columbus on November 6. As an adult working full-time, Bob completed his Associate's degree in Liberal Arts from Sinclair in 1991 and went on to earn a B.S. in Biology and Chemistry from the University of Cincinnati in 1998-- the first in his family to obtain a bachelor's degree. In 2007, Bob was awarded the Sinclair Alumni Association Service Award. Bob continually serves others in his retirement and is involved with many organizations. At the induction ceremony, he was honored for his service to the community, especially the restoration of historic gardens at the Dayton VA Medical Center.